On Saturday night we saw just a light dusting of snow, and the next system will be on Monday morning with 1-4 inches of accumulation. I am still excited about the system on Thursday with intense snow through the day and the snow might hang around long enough for powder on Friday morning as well. Win a Trip to Breckenridge! We’re giving away a ski-in/ski-out ski trip to Breckenridge, Colorado! Enter to win 5-nights lodging plus $3,000 CASH. Enter now for your chance to win a priceless slopeside vacation in the Rockies! View more details. On Saturday night, we were expecting a coating to 2 inches of snow, but the reality is that all mountains are reporting zero inches on Sunday morning and a thorough inspection of the snow stake cams showed at most just a dusting of snow for most mountains. Radar images showed some precipitation on Saturday night, but my guess is that the lower atmosphere was too dry and most of the snowflakes that fell from the cloud never made it to the ground. Now on Sunday morning, the nationwide radar image shows that we are between storms. The precipitation to our east is the system that moved over Colorado on Saturday night, and the precipitation over California and to our west is the next storm that should arrive on Monday morning. The storm on Monday morning continues to show the potential for light snow amounts. I was ballparking 3-6 inches for this storm, though I’m going to notch that down to 1-4 inches now as it looks like a quick mover which will limit the amount of snow we’ll see, and the latest high-resolution models are showing amounts below six inches. The best chance for snow will be Monday from just before sunrise through about noon. So head out on Monday AM to enjoy the best chance for soft snow early this week, and dress warmly as temperatures will be in the upper single digits to low teens. Following the system on Monday morning, Monday afternoon through Wednesday should be dry and the high temperatures on Tuesday and Wednesday should be comfortable in the 20s. The next storm will bring snow from late Wednesday night through Friday morning. 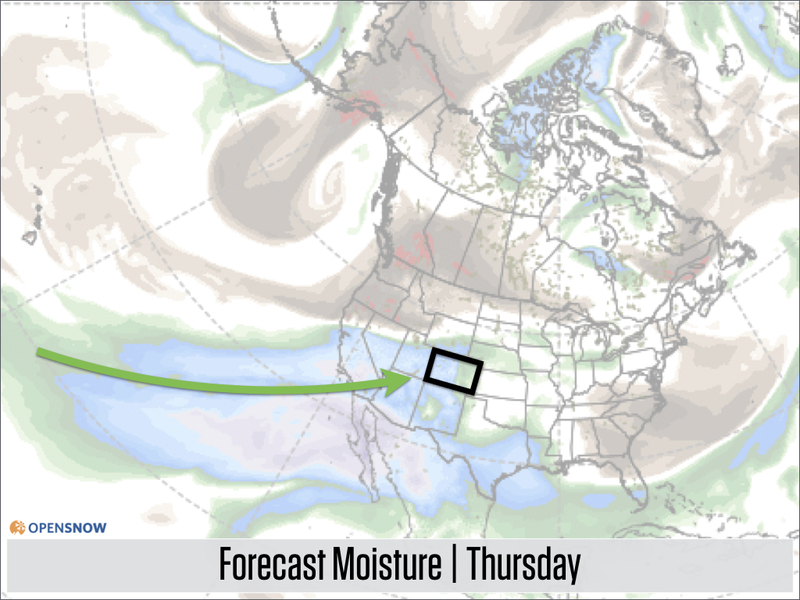 Accumulations should be significant thanks to abundant moisture that will track from the southern Pacific Ocean all the way into western Colorado. With big moisture comes the potential for big snow. The wind direction from Wednesday night through Thursday afternoon will be from the southwest, west-southwest, and west, and this should favor the southern and central mountains with the deepest totals. Then on Thursday evening through Friday morning, the wind direction should switch to blow from the west-northwest and northwest, which would favor the northern mountains. For the southern and central mountains, I think 8-16 inches is a reasonable early estimate and the best powder should be during the day on Thursday. Temperatures will be on the warmer side and the wind will be strong, so the powder could be the thicker, surfier type, and there might be lift delays at the highest elevations due to the strong winds. 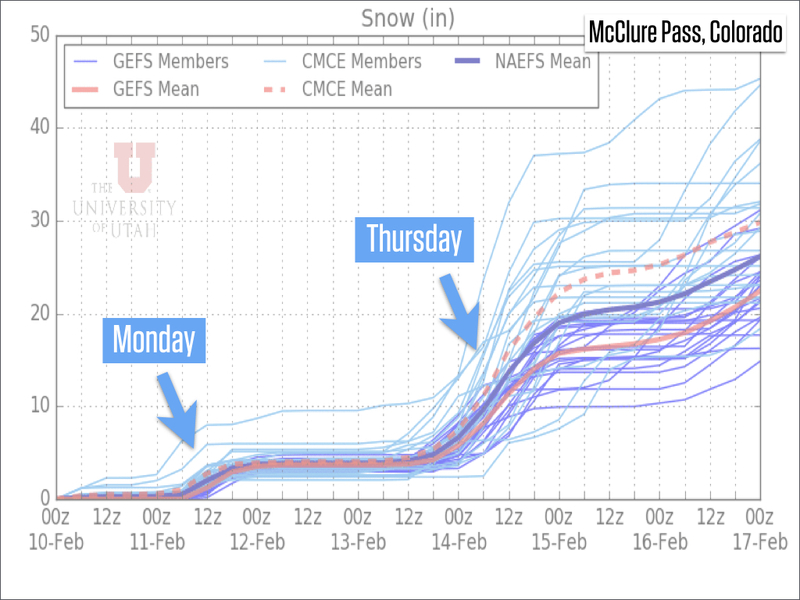 The University of Utah multi-model ensemble forecast continues to show 12+ inches for McClure Pass in the central mountains on Thursday. This forecast is holding steady over the past few days, which increases my confidence that Thursday will be a powder day. For the northern mountains, I think snow amounts on Thursday will be in the 4-8 inch range, limited by the unfavorable wind from the southwest and west-southwest. In past seasons, some of these high-moisture storms with a west-southwest wind direction have produced more snow than expected over the higher elevations of Summit County, so something to watch for, but I am keeping my expectations in check. On Thursday night, if the wind does swing around to blow from the northwest, this could be when we see a pop in the snowfall, and it could set up Friday morning as the time for the best powder. I think we’ll see dry weather on Friday morning, then what happens after that is unclear. 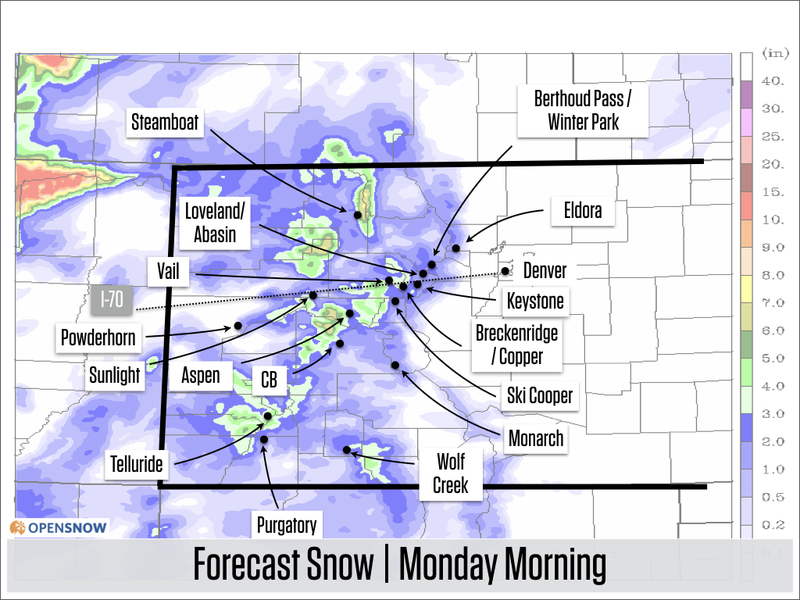 There is plenty of potential for snowfall through the weekend and into the following week, but there is also little consensus among the models about when the next waves of snowfall will move into Colorado and how strong each wave will be. I will hedge a bit and say that Sunday and Monday have the best chance for being the next powder days, as this is what the European model has shown for days. But both the old and the new version of the American GFS model show significant snow from late Friday into Saturday in addition to the snow on Sunday and Monday, and it’s unwise to simply discount a model’s forecast, even if it’s just one model, so maybe we'll get back on the storm train by Friday night. Stay tuned. My next update will be on Monday morning.